Adjusting and lubricating the drive chain is one of those jobs that any motorcyclist should be able to competently perform. The chain will stretch with normal use and require adjustment perhaps every 1000-3000km depending on your riding style and the local conditions. If the chain is allowed to become too slack or is not lubricated it can damage your motorcycle or even worse, come off and possibly cause an accident. To check the drive chain tension on your CB125E make sure it is neutral gear and put the motorcycle on its centre stand. The slack should be measured by deflecting the chain on its lower run halfway between the front and rear sprockets. The chain should move readily about 20-30mm (1 inch) without much effort. You can see on the image to the right that I have let my chain become very slack and dry, a combination of full throttle gear changes and wet weather perhaps. Adjusting the chain tension is really pretty easy, what you are effectively doing is taking the slack out of the chain by moving the rear wheel away from the engine. The swingarm has slots that the axle can move backwards and forwards in and its position is controlled by the adjusters. Turning them clockwise (the tightening direction) will move the wheel away from the engine increasing the tension of the chain. Turning them anticlockwise will reduce the tension on the chain. There are adjusters on both ends of the axle and they must be moved the same amount or else the wheel will not be sitting squarely in the swingarm. 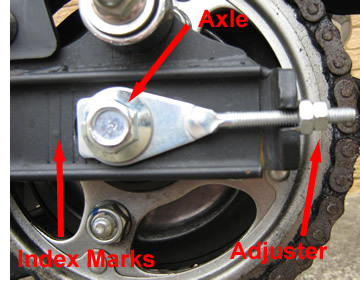 To make aligning the wheel easier there are index marks on both sides of the swingarm so that the alignment of the wheel can be checked. Start by loosening the axle nut and the lock nuts on the chain adjusters. Turn both drive chain adjusting nuts an equal amount of turns until the correct amount of drive chain tension is obtained. Check the tension on the lower run of the chain halfway between the two sprockets, it should move about 25mm (1 inch) without pushing it hard. 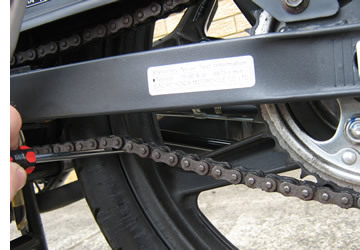 Do not overtension the chain as this will cause the chain and sprockets to wear out prematurely. Rotate the wheel a couple of times and check the slack again. Once you are satisfied check the rear axle alignment by comparing the index marks and the front edge of the chain adjusters. Both sides should be the same, for example if the left side is on the second mark then the right side should be as well. If no further adjustment is required tighten the lock nuts on the adjusters taking care not to change the position of the adjusting nuts. Holding the adjusting nuts with a spanner is a great idea while you tighten the lock nuts. Tighten the rear axle nut to 68Nm or 50lb-ft. Recheck the drive chain slack as you may have found tightening everything has changed its tension slightly. Adjust it again if necessary. Once satisfied with the chain tension it is necessary to check the operation of the rear brake as moving the rear wheel may alter its free play, particularly if you have had to move it a long way. The rear wheel should rotate freely and there should be an amount of freeplay when the rear brake is applied. The final step is to lubricate the drive chain if necessary. You might find in dusty or wet conditions that you are lubricating the chain far more than you are adjusting its tension. Both the chain tension and its state of lubrication should be inspected every time you ride. Just a quick look is all thats required. If the chain is dry it should be lubricated. Honda recommends the use of SAE80 or 90 gear oil or a commercially prepared drive chain lubricant. Im using Penrite Motorcycle chain lube which is readily available and comes in a handy aerosol can, perfect for penetrating into the less accessible parts of the chain. It is a synthetic lubricant that resists flinging off. With the motorcycle on the centre stand place a piece of cardboard behind the chain so that you arent spraying everything in sight with chain lubricant. 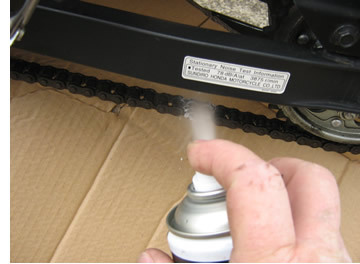 Spray a section of the chain and then rotate the wheel to expose the next unlubricated section. Do this until the entire chain is lubricated. Try and get the chain from several angles so that it is completely covered. Dont over do it by the way, excess lubricant will fling off and just make a mess.